Fort Myers, Florida resident Jill Jennings has completed her third full-length book of poetry, this one a chronicle of the years she spent living in Kihei, Maui. Come along with her and find out who is a haole, and who is a kama aina; taste a Hawaiian mixed plate lunch and try some pineapple wine from up island. Experience a tree in Lahaina that takes up two whole city blocks, and visit some of the best beaches in the world. In this collection of poems, every day is pau hana Friday, and we all look better in an aloha shirt! Books may be purchased from the author in person or by emailing her at magistra2jennings@gmail.com; from Amazon, P.J. Boox local bookstore, or Yawn's Publishing. Jill Jennings may be reached at www.jilljennings.org. Fort Myers, Florida resident Jill Jennings has completed her third full-length book of poetry, this one a chronicle of the years she spent living in Kihei, Maui. Come along with her and find out who is a haole, and who is a kama aina; taste a Hawaiian mixed plate lunch and try some pineapple wine from up island. Experience a tree in Lahaina that takes up two whole city blocks, and visit some of the best beaches in the world. 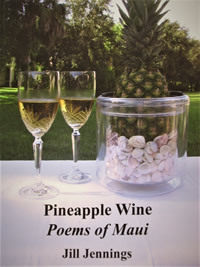 In this collection of poems, every day is pau hana Friday, and we all look better in an aloha shirt! Books may be purchased from the author in person or by emailing her at magistra2jennings@gmail.com; from Amazon, P.J. Boox local bookstore, or Yawn’s Publishing. Jill Jennings may be reached at www.jilljennings.org.